As a business with a flat roof, you probably knew the risks that come associated with this design. While you no doubt wanted a flat roof for aesthetic purposes, it’s perhaps been a while since you’ve had it inspected. In fact, you possibly haven’t had it inspected at all since it was built. 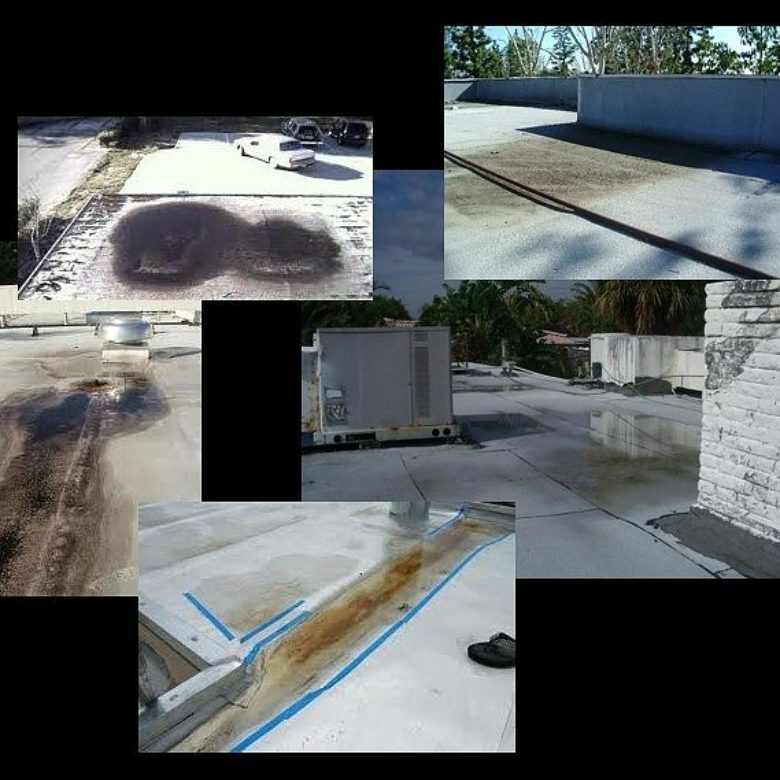 Things can start happening to your flat roof after five years without inspections. One of the most common issues is ponding water. This is when water manages to settle in one spot on your roof, hence causing considerable damage over time. When any water sits this long, it’s going to lead to fast deterioration. The question is, how do you know if you have ponding water problems? Can you see signs without an initial inspection? Leaks are going to become the most obvious signs you have ponding water. Unfortunately, leaks are sometimes subtle and you may not always know if you have one. Sometimes you may have a leak in part of the roof you can’t readily see. For instance, if you have an overly high ceiling in your business, you may not detect a leak from a distance. If you’re able to see your flat roof from specific viewpoints (without close-up inspection), you may not notice any leakage either. One reason is some roofing materials don’t always readily show damage, particularly tar and gravel. What’s important is to look out for any mysterious standing water you find indoors as evidence a leak is bad enough for immediate repair. Finding any wet spots on your ceiling is a surefire sign you have ponding water issues. As Popular Mechanics reminds, water spots can occur more than just on your ceiling. Keep an eye out for wet spots on your walls as signs the leakage worsened. If you can, check every inch of your ceiling space to see how many wet spots you encounter. It’s not always possible to see them from considerable distances. You may have to use a ladder or indoor crane to inspect your ceiling since some wet spots don’t show up until seen at close range. What usually causes ponding water in the first place is poor outdoor drainage. Signs of this start to become apparent without even having to step foot on your roof. Look outdoors and see if your drain pipes are properly routing water into the sewers. If not, it’s likely accumulating on your flat roof without going away immediately. Water could stay on your roof for well over 24-48 hours, depending on how heavy a recent rainstorm was. Can you see part of your flat roof out of a nearby window? Maybe you fly regularly, giving you ability to see your flat roof once in a while as you fly over. Any pools of water you see standing on your roof from these vantage points definitely means ponding occurred. 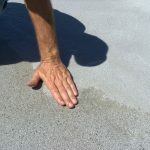 Even though you’ll need a full up-close inspection, ponding isn’t always subtle. After heavy rainstorms, those puddles could cover a good portion of your roof. The bigger the ponding, the longer it’s going to take to go away, and the larger the potential damage. 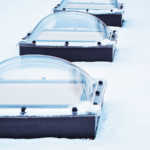 Keep in mind inspecting your roof every six months to a year is a good way to avoid the above issues. 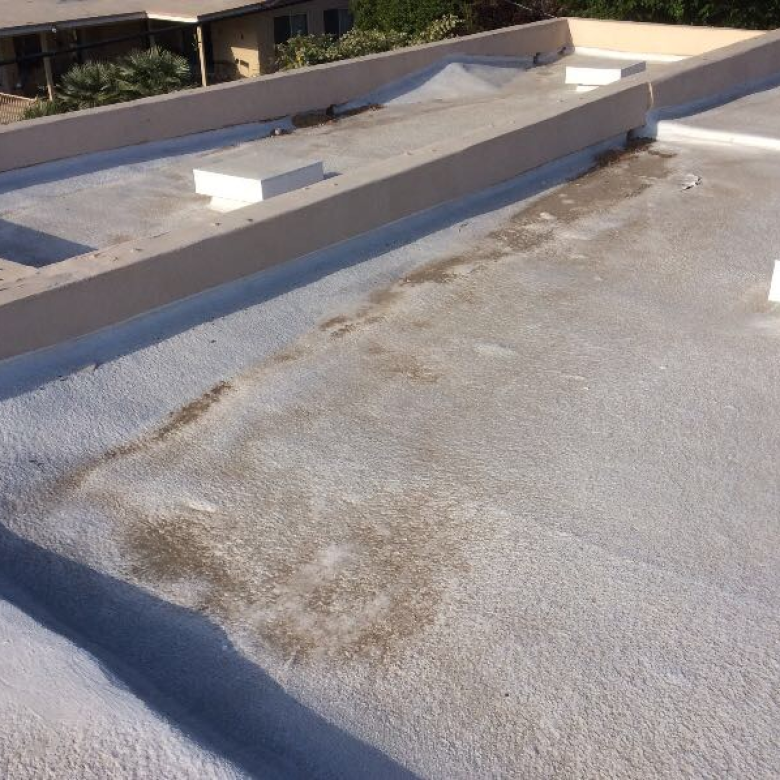 However, you may simply need a new coating on your flat roof after continual ponding events. 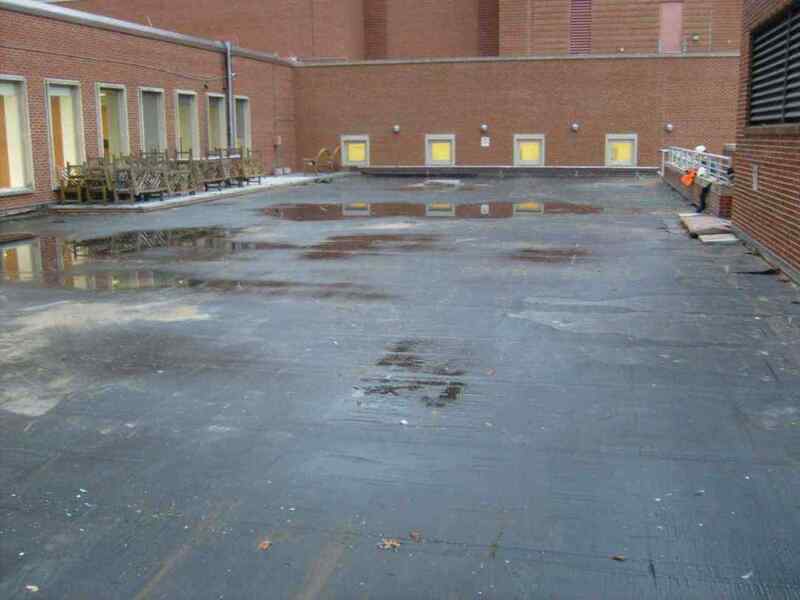 At RoofSlope, we’ve invented a coating that quickly and easily fills in low spots to prevent future ponding. Contact us to find out more about the materials available to eliminate ponding water.